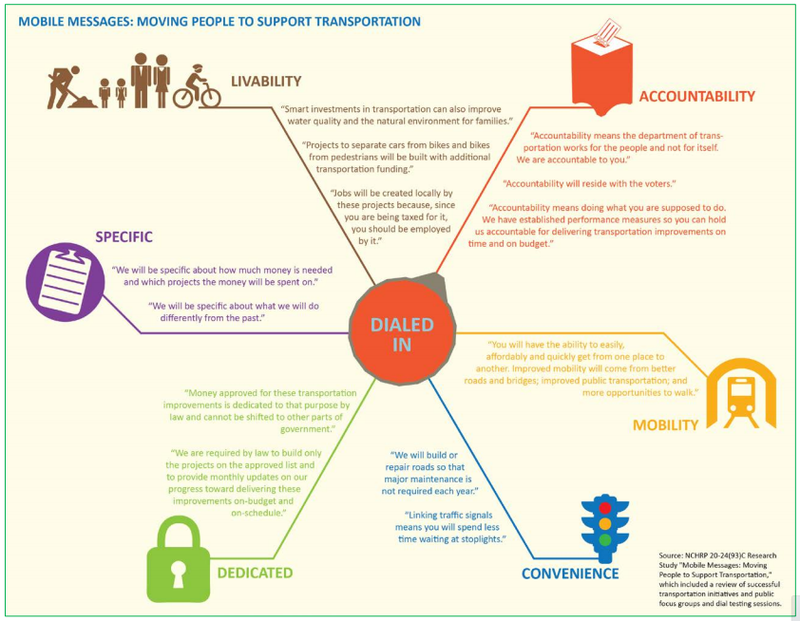 “Mobile Messages: Moving People to Support Transportation,” analyzes the results of more than two dozen case studies; a survey of transportation agency officials; eight focus groups; and, two dial testing sessions. It found that people are more likely to support increased transportation investment if the messages are personalized, localized and relevant. The researchers said that successful campaigns must focus on livability, accountability, mobility and convenience. Funding proposals also must be specific and funding must be dedicated. While these conclusions are probably not surprising to people who work in transportation communications, the extensive research also suggests that some of the most common messages used by transportation agencies are actually not persuasive and tend to fail to move people toward support. The report was prepared by Shane Peck of Parsons Brinckerhoff and Lance Gentry of Heartland Market Research for the American Association of State Highway and Transportation Officials (AASHTO), with funding provided through NCHRP Project 20-24, which is administered by the Transportation Research Board (Full disclosure, I work for AASHTO and helped review this research report). The researchers reviewed 27 case studies of transportation funding campaigns between 2010 and 2014 and found that successful campaigns focused on mobility, economy, and accountability. They also named specific projects and listed the long-term benefits of investments. The unsuccessful campaigns focused on maintenance and funding shortfalls, as well as the poor state of existing infrastructure. These campaigns also were vague about funding. And, the research also found that increasing safety as a message/theme was not successful. Meanwhile, the focus group and dial testing sessions revealed that most participants valued fixing the current transportation infrastructure over new projects. They also wanted funding proposals to be specific about the projects, ensure that any money raised would be protected from use on other government priorities, that the program be as local-focused as possible and that any revenue increases be temporary. The NCHRP report confirm previous NCHRP research published in 2010 that suggested themes, messages and words that work with the public. The new research also complements two new studies that also gauged Americans’ support for investment in transportation. There are a number of very insightful observations to be gleaned from these reports. Perhaps most significantly is that according to the researchers, the very process of talking through transportation issues with focus groups and dial testing participants positively affected their feelings about the issue. There indeed is not a single critical message that will work in every situation. But engaging with the local community and learning about their desires and expectations while sharing some of the system’s shortcomings and needs will definitely help increase the odds of earning support. Previous Previous post: Boom! Wait, you have a cannon?